Baagh Naach or Tiger Dance This Kosli Sambalpuri folk dance is performed in Binka and Sonepur of Subarnapur district during the month of chaitra. The dancer (only males) paints his bare body with yellow and black stripes like that of a tiger and attaches a suitable tail. One or more dancers move from house to house and after a crowd gathers the dance begins. The dancers are accompanied by a drummer and a bell player who provides the music. The dance is nothing but acrobatic movement in rhythm. They make hissing sounds while dancing. Tiger dance is also performed in Berhampurduring the Thakurani Jatra. Dances performed by girl Child : Chhiollai, Humobauli and Dauligit. Dances Performed by teenagers : Sajani, Chhata, Daika and Bhekani. Dances Performed by Youths : Rasarkeli, Jaiphul, Maila Jada, Bayamana, Gunchikuta . The man who worship work, composes "Karma" and "Jhumer" invigorating Lord Vishwakarma and the Karamashani goddess. Dhap : This Kosli Sambalpuri folk dance is mostly performed by the Kandha tribe of Kosal region .Both men and women participate in the dance. Men of one village dance with women of another village. Usually unmarried boys and girls take part. The dance is performed during marriage ceremony and more often for the sake of recreation. The dance is named so because of the accompanyinginstrument called ‘Dhap.’ The dhap is in the shape of a Khanjari made up of wood with one side open and the other side covered with a piece of animal skin. The dhap dancer holds the dhap with his left hand, the sling slung over his left shoulder, and beats with his right as well as left hand. 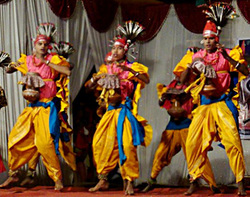 Ghumra : Kosli Sambalpuri Folk dance Ghumra is also known as vira-badya of koshal region. It was used during war times in the past to encourage soldiers. It is also used to give social message like forestation, saving girl child,literacy etc. It is a typical drum. It is just like a big pitcher with a long stem made of clay. The mouth is covered with the skin of a Godhi (a reptile). When played with both hands, it produces a peculiar sound quite different from other varieties of drums. The dance performed to the accompaniment of this drum is called Ghumra Naat. It begins fifteen days before the Gamha Puni (full moon in September) and culminates on that night in a ceremonial performance. Young men of various communities fix a Ghoomra each on the chest with string tied the body simultaneouly dance and play. The performance begins with slow circular movements. The Nisan is a smaller variety of Kettle-drum played with two leather-sticks. The player always places himself in the centre and controls the tempo of the dance. He also indicates change over the movements. After a brief dance sequence in different rhythmic patterns all the dancers move in a concentric circle and then stand erect in a line. Then enters the singer who first sings in praise of Saraswati and other gods and goddesses. During the song the drums remain silent. After the prayer-song Chhanda,Chaupadi and other literary folk-songs are sung. Each couplet of a song is followed by a dance. At the end of the each couplet the singer adds 'Takita Dhe' which is a numonic syllable for the time-beats and indicates the dance to begin. Ghumra dancers are basically from Kalahandi and Balangir dist. Karma Naach : Karam or Karma literally means 'fate' in Kosli Sambalpuri language. This pastoral Kosli Sambalpuri folk dance is performed during the worship of the god or goddess of fate (Karam Devta or Karamsani Devi), whom the people consider the cause of good and bad fortune. It begins from Bhadra Shukla Ekadasi (eleventh day of the brightmoon of the month of Bhadra) and lasts for several days. This is popular among the scheduled class tribes (e.g., the Binjhal, Kharia, Kisan and Kol tribes) in the districts of Balangir, Kalahandi, Sundargarh, Sambalpur and Mayurbhanj. This dance is in honour of Karamsani, the deity who bestows children and good crops. After the puja is done it is followed by singing and dancing in accompaniment of drum (maandal), cymbal etc. The dance performance full of vigour and energy combined with charm of the youth decked with colourful costumes in exuberance of red cloth, set in peacock feathers, skillfully designed ornaments made of small conch shells, brings the onlookers as well as the performers to a mood of trance and ecstasy. In this dance both men and women take part and continue to engross themselves for the whole night. The skillful movement of the young boys with mirror in hand indicates the traditional pattern of love-making in course of dancing and singing. The dance is performed sometimes by boys in group, sometimes by girls in group and sometimes both the sexes together. The subject matter of songs constitutes the description of nature, invocation to Karmasani, desires, aspiration of people, love and humour.